Perfect for fans of C.J. Sansom and The Name of the Rose, the fourth historical thriller featuring Giordano Bruno, heretic, philosopher and spy. Sir Francis Drake is preparing to launch a daring expedition against the Spanish when a murder aboard his ship changes everything. A relentless enemy. A treacherous conspiracy. 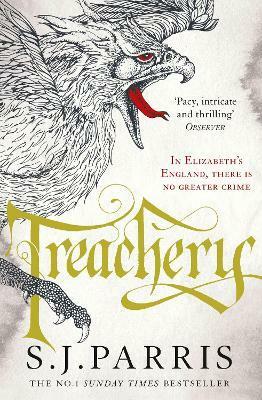 Giordano Bruno agrees to hunt the killer down, only to find that more than one deadly plot is brewing in Plymouth's murky underworld. And as he tracks a murderer through its dangerous streets, he uncovers a conspiracy that threatens the future of England itself. No. 1 Sunday Times bestseller S. J. Parris is the pseudonym of the author and journalist Stephanie Merritt. It was as a student at Cambridge researching a paper on the period that Stephanie first became fascinated by the rich history of Tudor England and Renaissance Europe. Since then, her interest has grown and led her to create this series of historical thrillers featuring Giordano Bruno. Stephanie has worked as a critic and feature writer for a variety of newspapers and magazines, as well as radio and television. She currently writes for the Observer and the Guardian, and lives in Surrey with her son.